Set in Madrid's exclusive Salamanca district, the city's financial hub, this hotel is a stone's throw from upscale shopping and attractions including Retiro Park, Barclaycard Center and Thyssen-Bornemisza Museum. 146 guest rooms feature wood flooring and upscale amenities, offering a comfortable retreat after a day out exploring the city. 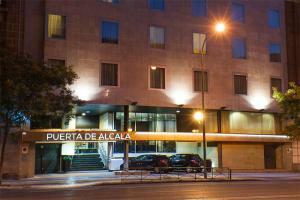 Located in Madrid, Spain, close to Retiro Park and within walking distance of Principe de Vergara metro station. An elegant restaurant offering a full breakfast buffet and a pleasant bar with views of the garden area.